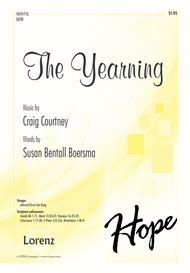 The Yearning composed by Craig Courtney. For SATB choir, piano. Sacred Anthem, Advent, Christ the King. Octavo. Published by Lorenz Publishing Company (LO.10-4171L).A stunning work of extraordinary power, this inspired anthem begins with a haunting melody that underscores the yearning of "hearts weighed down by ancient grief and centuries of sorrow." The melody and lyrics gradually build to a dramatic climax of fulfillment that is found only in Emmanuel as His faithful people await "the day of His appearing.". 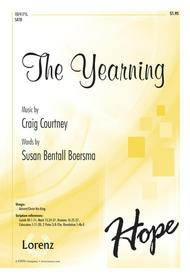 The Yearning composed by Craig Courtney. For SATB choir and piano. Sacred: Advent, Christ the King. Choral score. Published by Lorenz Publishing Company (LX.10-4171L).A stunning work of extraordinary power, this inspired anthem begins with a haunting melody that underscores the yearning of "hearts weighed down by ancient grief and centuries of sorrow." The melody and lyrics gradually build to a dramatic climax of fulfillment that is found only in Emmanuel as His faithful people await "the day of His appearing. ".About Digital Print Sheet MusicDigital Print is printable sheet music available anytime, anywhere. Just purchase, print and play! View your online sheet music at home, school, work or anywhere you have a computer connected to the Internet. Use our iPad app to view your digital sheet music on the go. With Digital Print, you can print your digital sheet music immediately after purchase, or wait until its convenient. And our software installation is easy - we'll guide you through the simple steps to make sure you have Adobe Flash Player, Adobe AIR and the Sheet Music Plus AIR application.